Every New Year’s Eve, Stephanie Blozy and her sister set goals. In 2005, with both of them looking for a change, they agreed they should go into business together. Next, they considered what kind of business. “We listed our passions, and we only had 2: chocolate and running. We liked to bake, but it never looked good, so we decided we should open a running store,” Blozy explains. And they were serious. 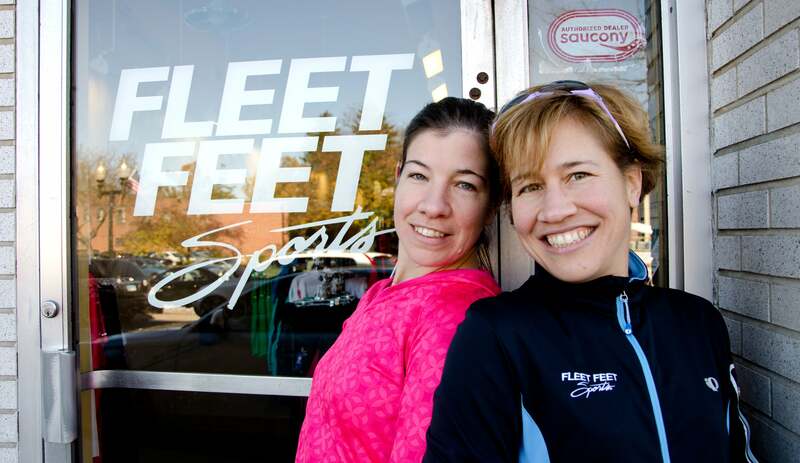 Three-and-a-half years later, the sisters took over Fleet Feet Sports in West Hartford, Connecticut (coincidentally located just a mile and a half from their parents’ home). “The world still doesn’t think women are the most capable business people for one reason or another. We wanted to show them that 2 sisters could do this.” They’ve never looked back. Blozy is the extrovert, who loves mingling with customers. Her sister runs the backend of the business and their dad, who is 67, runs the kids’ program. Blozy’s dad has run 30 marathons, including Boston every decade since his 20s, her sister 12, and Blozy has now run 7. “But I have done a 50K, so I’ve topped them all.” And that competitive nature is what brought Blozy to Newton. Blozy admits she was initially skeptical about Newtons and the benefits of the lug system. But then, Blozy put a woman in her beginner program in a pair. She returned to the store raving about the shoes and talking about how she was running 2 minutes a mile faster in them. Then a family friend came into the store talking about how he was faster in these shoes. “My sister and I are pretty competitive. We were going to run the Las Vegas Rock ‘n’ Roll marathon. I needed any advantage I could get,” she says. She started running in Newtons. But much to Blozy’s chagrin, her sister caught wind of how well Newtons were working for Blozy, and changed, too. “She beat me by 30 seconds.” Now her dad is running in them, too. “The Newton shoes make you so much more efficient in the turnover/gait cycle,” she enthuses. Seems like Blozy and her sister have also put the special back in specialty with the community they have created around the store. After the earthquake in Haiti in 2010, they collected shoes for survivors. “We were hoping to donate a couple hundred pairs of shoes. We ended up with 20,000 shoes.” Then, more than 100 people showed up to help match shoes and load the truck. And after Hurricane Sandy in 2012, the store put together more than 100 care packages for families. Last spring, more than 500 participants showed up for their run for Boston. To boot, their kids program has a robust offering for kids with autism and every four years they give out a college scholarship to a local high school runner. They do it every four years, so they can support a student through college, not just for one year. In all of this, they expanded the store from 1500 square feet to 3500.
Who knows what’s next. If they set out to show the world two sisters could do it, they have.